This primitive dirt parking area is located alongside Bear Canyon Road near its northern end and has room for about 10 vehicles. 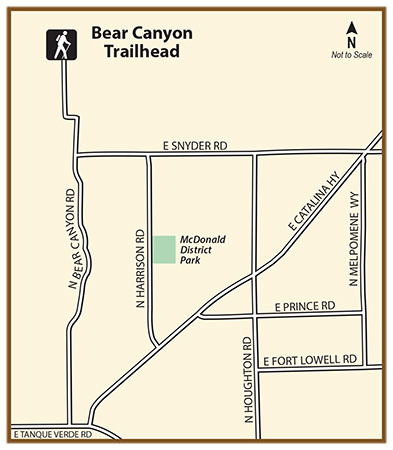 Users can follow the undeveloped county dirt road bed north a short distance to access to the Bear Canyon area of the Coronado National Forest and the Bear Canyon Trail. Bicyclists are not permitted beyond the end of the road where trail enters a wilderness area. Open dawn to dusk. Dogs not permitted on trails.